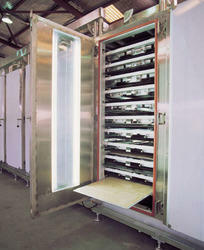 These energy efficient and highly functional range of Curing Oven provide for best results with less processing time. Available in optional choices of batch/conveyorised type configuration, these systems can be offered with dynamically balanced blower for uniform temperature as well as superior insulation support for eliminating possible heat loss. Primarily finding use in automotive industry sector, we can offer the system in customized configurations so as to match up with specific composite curing requirements. 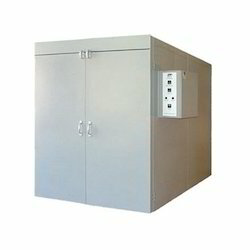 With the units coming factory tested and certified, these can be provided with options of thermocouple jack panels, digital programmable controllers, data acquisition devices, motorized dampers, process timers as desired in specific processes. Offering uniform paint drying support with different choice of installation like vertical and horizontal, these Paint Drying Oven options offered support processes involving removal of water from water based coating and adhesives through passing it through hot air. 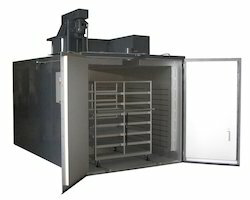 Allowing for uniform drying of paint, these ovens offer superior removal of moisture coatings/adhesives and find suitability for processes involving powder curing, paint baking, water drying. The presence of advanced thermostatic controls provided also assures of precise operation handling. Some advantages of the system include speedy dying support, enhanced product quality and economized processing costs. Our organization has gained appreciation as the affluent manufacturer and supplier of a highly efficient Tray Oven. Oven provided by us are meticulously tested on numerous quality parameters and are widely applicable in different industries for allied applications. Provided oven is manufactured by using an excellent quality components and contemporary technology by our skilled engineers. 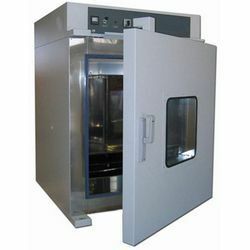 We provide this oven to the clients in various specifications and at affordable price. We are highly equipped with the state-of-the-art infrastructure and keeping in mind the variegated needs of clients, we are offering Industrial Ovens. These are used for various applications such as in drying, baking, curing, preheating and other purposes. These ovens are well-known for performance and durability. Widely demanded our offered products are sturdy in nature with abrasion resistance qualities. 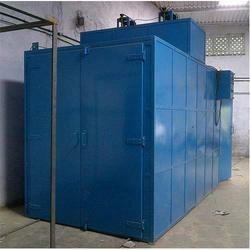 Enriched with vast experience, we are involved in offering various Vacuum Oven Machine with customized solutions. C with air blowing or vacuum system. Moreover, client can get the provided products from us at very economical prices. Digitally display with digital control. Timer with temperature controller which runs over sensor commands.